Technically speaking, the futures became a ‘mechanical’ buy on this morning’s plunge to the red line, a midpoint Hidden Pivot support at 17.745. In practice, however, due to the $1500-per-contract entry risk, the only way I could have suggested getting aboard would have been to ‘convert’ the mechanical signal to a 'camouflage' one. This is never an easy task, and that’s why I didn’t suggest it. Lest subscribers feel they missed an opportunity, the ‘camo’ entry approach, even on the 3-minute chart, and even seen in retrospect, was treacherous, to put it mildly. 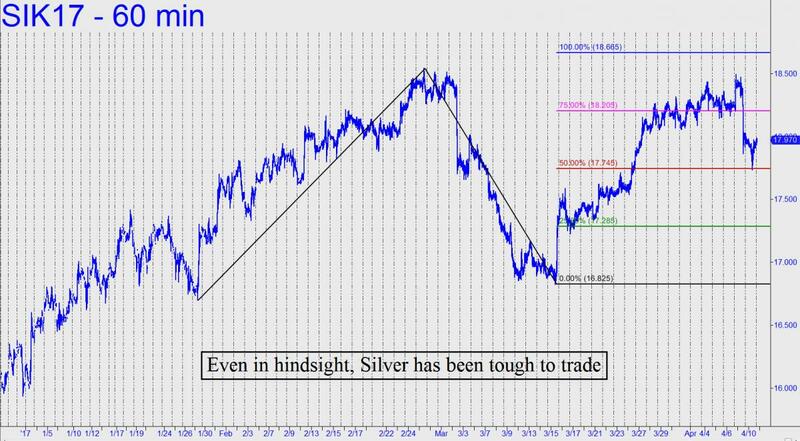 What this implies is that we will get long in silver futures using only the most cautious approach. Specifically, we’ll look for a ‘mechanical’ trigger only on a pullback to the green line, or via whatever juicy ‘counterintuitive’ opportunities present themselves intraday. Even then, we’ll do the CI trade only if the signal occurs within a textbook ABC pattern on the lesser charts. And a word of caution to those who would trade the mini-contract to reduce risk; In fact, the mini is so illiquid that in many instances it doesn’t help much to be precisely right about trend and target.